Tanghalang Pilipino showcases its latest offering after its success with the children’s musical, Sandosenang Sapatos with Layeta Bucoy’s Prinsipe Munti – an adaptation of the beloved children’s book, Le Petit Prince by Antoine de Saint-Exupéry. 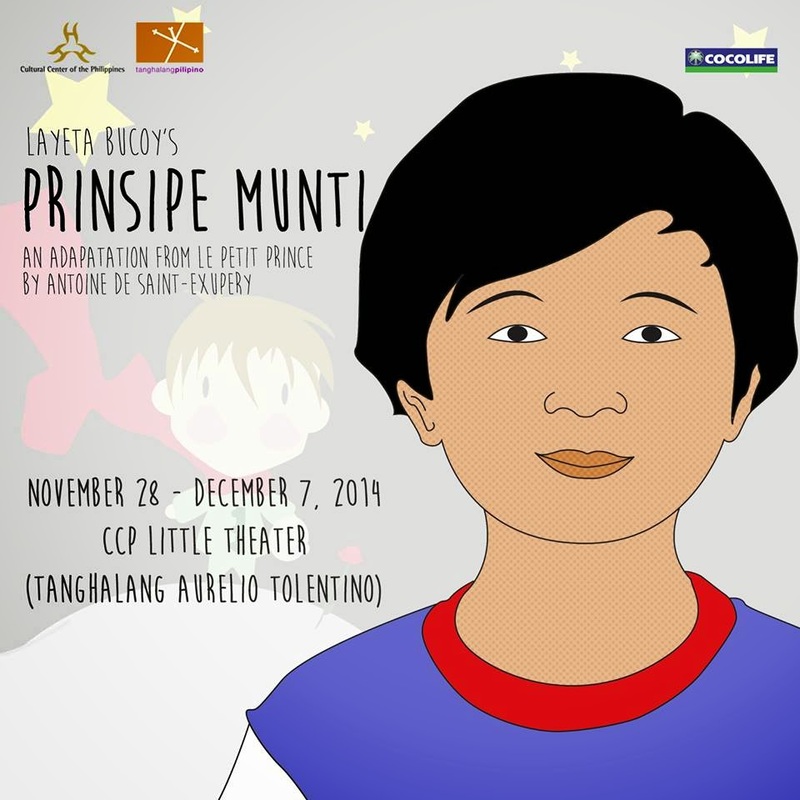 Prinsipe Munti runs from November 28 to December 7, 2014 at the Tanghalang Aurelio Tolentino (CCP Little Theater). Shadow play and puppetry provide the spectacle for Prinsipe Munti’s adventures led by Teta Tulay of the Anino Shadowplay Collective. In this staging, audiences will witness a mix of actors performing live and puppetry together with original music by Toni Muñoz and lighting design by John Batalla. Karilyo, the shadowplay group of DLS-College of Saint Benilde’s Office of Culture and the Arts are the pupper creators and shadowplay mentors Tuxqs Rutaquio provides overall direction. The Tanghalang Pilipino Actors’ Company comprise the cast with Jonathan Tadioan as Alamid (the fox), Marco Viaña as Piloto (the pilot), Regina De Vera as Rosas (the rose), Lhorvie Nuevo as Ahas (the snake), Doray Dayao as Negosyante (the businessman), JV Ibesate as Lasenggo (the tippler), Antonette Go as Artista (the conceited man), Aldo Vencilao as Presidente (the king), and Racquel Pareño as Rosas 1 (the rose in a garden on Earth). Micko Laurente and Allen Immanuel "Air" Ryce alternate in the role of Prinsipe Munti. 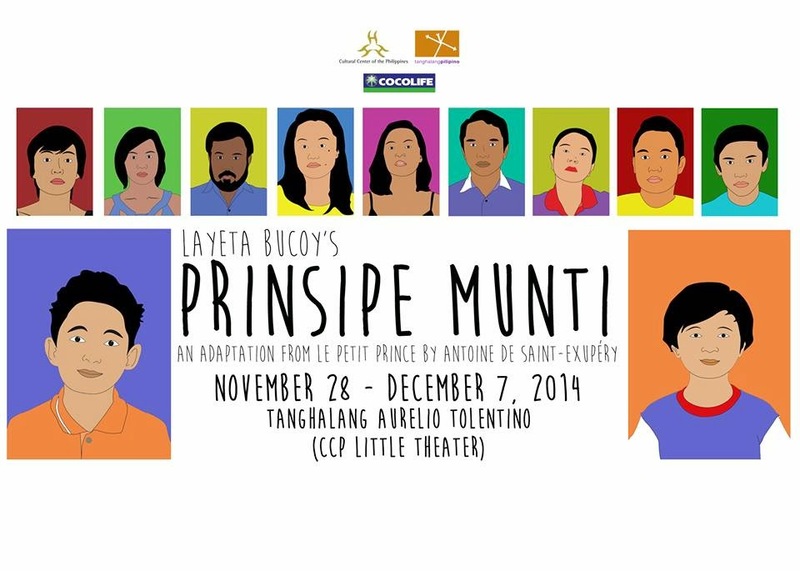 Prinsipe Munti runs from November 28 – December 7, 2014 with shows at 10AM, 2PM and 6PM at the Tanghalang Aurelio Tolentino (CCP Little Theater). Tickets (P600, P800 and P1,000) are available through Tanghalang Pilipino: 832-1125 loc 1620 / 1621 (0905-254-4930/0908-894-1384) and Ticketworld: 891-9999 / www.ticketworld.com.ph.